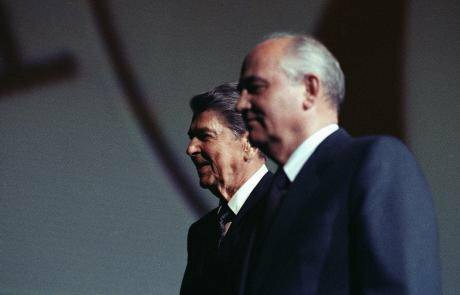 Both Mikhail Gorbachev and Ronald Reagan were involved in creating "dialogue" between the Soviet Union and the US during the late 1980s. Photo: Mark Lennihan / AP / Press Association Images. All rights reserved.When Russian troops entered Syria in 2015, many people started talking about the inevitability of a military conflict between the US and Russia. In mid-April 2017, President Donald Trump declared that Vladimir Putin, Russia and Iran “would pay a high price” for a chemical attack on the city of Douma that killed several dozen people. The US announced that it was preparing for a retaliatory missile strike on Syrian army bases, drawing a threat from Russia’s Ambassador to Lebanon that Russia would shoot down America’s Tomahawk missiles in response. The American public are used to treating their president’s outrageous tweets as a joke (Trump on missiles: “Get ready Russia, because they will be coming, nice and new and smart!”), but in these circumstances Trump’s warning sounded like a return to the apocalyptic mood of the Cold War. After all, in Vladimir Putin Trump is facing another unstable character who, unlike him, doesn’t have to answer to the state and the public. It was Putin who first resorted to the nuclear threat as a tool of international politics when he stated in 2015 that he was prepared to put Russia’s nuclear weapons on standby during the Crimea crisis in 2014. The Western allies’ April 2018 rocket attack on Syrian bases was, nevertheless, successful, and Russia, fortunately, kept out of it (at least officially: the anti-aircraft defence forces that shot down the Tomahawks could have been commanded by Russian officers). The war with the west was postponed and the period up to and after Putin’s recent re-inauguration (or until after the Football World Cup) can be seen as a time of relative quiet. Less than a month after the new flare-up in Syria, at the 9 May Victory Day Parade in Moscow, the usual empty intercontinental missile launchers rolled across Red Square: this year they were for Yars missiles (in 2017, it was Topol-M missiles). One 0.9-1.2 megaton Yars can destroy a city of a million people in an instant (the bomb that fell on Hiroshima had an explosive power of 13-18 kilotons). Apart from its Yars missiles, Russia also has one-megaton Topol-M and 25-megaton Voevoda rockets – and a lot more besides. Fifty years ago, humanity already knew about the futility of nuclear war, given the stockpile of warheads accumulated by that time. The doctrine of Mutually Assured Destruction (MAD) was a product of the 1960s. But now we have a new arms race. The number of warheads may be decreasing, but billions are being spent on delivery (bombs and missiles), as well as control and direction systems. Meanwhile, there is no mass international anti-nuclear movement of the kind that existed 30 years ago. We hear nothing about scientists calling on their governments to stop nuclear escalation. In the euphoria that greeted the end of the Cold War, it seems, the world has lost its awareness and understanding of the possible consequences of a global conflict. 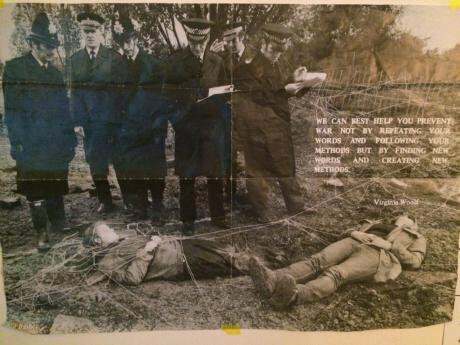 A poster showing women arrested after a silo dance at Greenham Peace Camp. Source: Sophie Mayer. Admittedly, a couple of useful bodies have continued to function since the time of Détente. The Pugwash Conferences were founded in 1957 by a group of scientists, including Einstein and Joliot-Curie, and have been gradually turning into a kind of peace committee over the years. Many Soviet, and later Russian scientists have been involved with it – but only those recognised and approved of by government: there have been no new Andrey Sakharovs. Billionaire industrialist and public figure Cyrus Eaton, one of Pugwash’s founders and its main sponsor, was awarded the Lenin Prize in 1960 “For strengthening peace between nations”. There is also ICAN – the international campaign to abolish nuclear weapons, which most of us only heard about last year, when it was awarded the Nobel Peace Prize. These organisations, with their budgets, grants and management structures, can’t however be regarded as a genuine mass civil anti-nuclear arms movement of the type that existed in the 1980s. While there are enough weapons in the world to destroy our planet, we need to think again about global danger. In 1983, Andrey Sakharov wrote an open letter from exile to his colleague, the American theoretical physicist Sidney Drell. In that year, Samantha Smith, a young American girl, had already visited the USSR on a private invitation from the then Soviet leader Yuri Andropov, who had been responsible for exiling the great academician to Gorky (Nizhny Novgorod). Samantha’s visit may have promoted rapport between the USA and the USSR and the launch of the future policy of Détente, but it was still the peak of the Cold War. The total capacity of the world’s nuclear arsenal at the end of 1980 (50,000 warheads), he wrote, had a cumulative power of 13,000 megatonnes; by comparison, the payload of all the weapons used during the Second World War was a mere six megatonnes. The first 3-D model of nuclear winter, obtained by the CIA from the International Seminar on Nuclear War in Italy 1984. 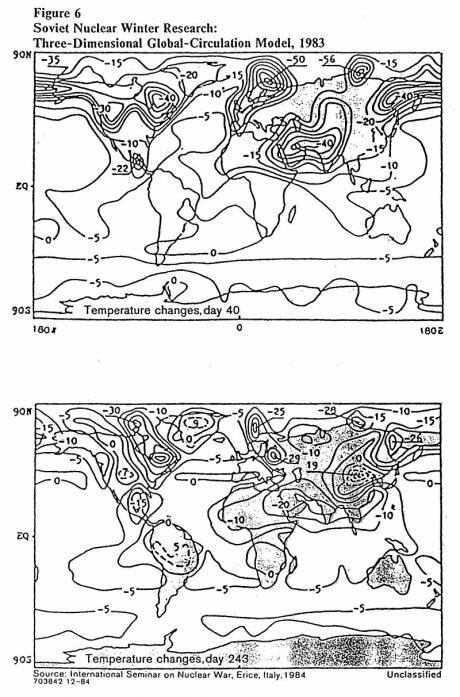 It depicts the findings of Soviet 3-D computer model research on nuclear winter from 1983. Public Domain / Wikipedia. 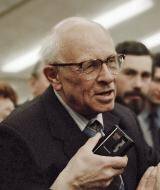 But what, according to Sakharov, would be even more serious for humanity was the indirect ecological and social repercussions of the blasts. One such factor would be the consequences for the atmosphere, which would lose its transparency as a result of the smoke and dust raised and be starved of oxygen, leading to a nuclear winter. This single factor, the physicist believed, would be enough to destroy all life on the planet. Here, Sakharov writes that there can be no victors in a large thermo-nuclear war (“It’s collective suicide”) and comes to the following conclusion: “The only reason for having nuclear weapons is to deter nuclear aggression from a potential enemy.” So he proposed the abolition of nuclear arsenals using a process of parity, where each side would gradually and simultaneously reduce its number of warheads. Estimates do indeed exist. The American climatologist Alan Robock has published the results of a computer model showing the effects of a local nuclear war between, say, India and Pakistan. The model presupposes that each side explodes around 50 nuclear missiles (about 0.3% of the global arsenal in 2009), each equal in power to the bomb exploded over Hiroshima, setting them off in the atmosphere above cities. This, he has calculated, will trigger an unprecedented climate change known as a “nuclear winter” and comparable to the Little Ice Age, a period of regionally cold conditions in Europe between roughly 1300 and 1850 CE. The Soviet Union’s perestroika years coincided with an unprecedented international anti-nuclear civil society movement, whilst Gorbachev initiated moves to sign important agreements on arms reduction between the USSR and the US. There had, of course, been pacifist protests in western countries before, against the deployment of American missiles in Europe, for example, but never before had such a powerful peace movement encompassed every continent at once. Among its high profile elements was the “Nevada-Semipalatinsk” anti-nuclear movement founded in Kazakhstan in 1989, thanks to which the number of planned nuclear tests on the Semipalatinsk range were halved, and the range closed down by the county’s President Nazarbayev in 1991. We can put aside the question of the extent to which Mikhail Gorbachev’s actions were governed by his consciousness of impending economic catastrophe caused by the arms race. It was his actions that mattered: from the end of the 1980s, a process of arms reduction in both the US and USSR led to the liquidation of two thirds of the world’s nuclear arsenal (from 63,000 warheads in 1987 to 20,250 in 2010). The remaining stockpiles are, of course, still sufficient to exterminate life on the planet many times over. Today, the supposedly forgotten fear of nuclear war is being reborn. Rhetoric about a possible victory in such a war is becoming literally state-controlled in Russia. And mantras such as Zbigniew Brzezinski’s pronouncements – that while 500 billion dollars owned by Russia’s elites still lie in American banks he can’t see any chance of Russia using its nuclear potential – don’t do much to calm the situation. In 2016, Mikhail Gorbachev told the New Times magazine that: “An accident – that’s what I’m afraid of. I’m talking about the danger of a technical accident. And then there’s the danger of nuclear arms getting into the hands of flagrant opportunists. I worry that when people talk about local wars, they sometimes find the idea of using nuclear arms acceptable – and then our government goes and writes it into its defence policy.” Here Gorbachev was effectively repeating his concerns of 30 years ago. A heightened risk is not just a question of the number of warheads you have in your arsenal, but also the quality of your propaganda. The intentions of the “President of Russia”, appointed thanks to an illegal and anti-constitutional election and backed into a corner by his fear of inevitable criminal charges if he loses power, have become more or less clear over the last few months: he wants to raise tension to the max and, relying on global fear of his failure, try to make himself president for life. Perhaps it won’t get to that stage, and an operator’s shattered nerves and antiquated equipment will perceive a reflection bouncing off Elon Musk’s Falcon Heavy rocket as a nuclear attack, sending us into an accidental nuclear war. It feels as though everyone is very interested to find out what will become of the Earth when a series of essential conditions suddenly fall murderously into place and a fateful finger makes contact with the red button.